If you or your kids are into serious gaming, you know you will need a gaming desk sooner or later. Yes, there are a lot of different products to choose from – many different colors, shapes, prices, features can be found on today’s market. These things don’t make this search any easier, especially if you are not familiar with this area, but don’t despair. You can do it; you only need a little bit of guidance, and the best gaming desk will be in your possession before you know it. If you have some doubts about gaming desks and think you can just refurbish your old desk from the garage and use it for gaming, think twice before you do it. Although desks are universal in a general way, the fact is that they have differences that can cause some serious problems, from practical issues to serious health conditions. Therefore, before you do something like that, have in mind that today’s gaming desks have many advantages over the regular desks, things that make a huge difference. Cable management, as its name suggests, is responsible for proper placement of wires and cables, allowing for their organization and positioning and preventing you from having a “forest” of cables on your desk. We all like surfaces to be as clear as possible, and cable management helps us in that department. Proper placement of features and their intuitive positioning is very important for allowing a maximum productivity and practicality. If you can find what you are looking for in a matter of seconds, you got yourself a winner. Ergonomics basically refers to how you feel when you use something. In case of a desk, it means that it has to have a proper height that will best suit the user, and will not cause unpleasant positions that result in strain injuries. Also, the presence of a keyboard tray allows for finding the perfect position for it, adjusting it to the rest of the setup and preventing possible wrist strains that come as a result of wrong positioning. There is no need to talk much about this aspect; space is essential, especially if you are using multiple monitors, large cases, etc. Gaming desks are the ones that give their best in this department and provide the best possible solutions, excellent space organization and a lot of room for all the needed hardware. Choosing a proper desk for your needs deserves a bit of involvement. As previously mentioned, there is a vast number of options and people can easily get lost in all that variety of shapes, sizes and numerous features, many of which are completely unfamiliar. Luckily, this guide will help you with that problem and tell you which of the characteristics you should pay attention to. Since this is a piece of furniture that is visible to everyone, it should be beautifully designed and eye-appealing. This is not mandatory when you are buying yourself a piece of furniture with a purpose, but if you are going to look at something day after day for a couple of years in a row, better get yourself something that you are going to be pleased with. The last thing you need is to buy a desk that cannot fit into your room. Therefore, do your homework, measure the available space before the purchase and save yourself from the unnecessary hassle. If you need half a day to assemble your desk, it isn’t worth the money. You bought yourself a desk, you didn’t sign up for a carpenter course. More is always better. No matter how modest your configuration is, buy yourself a desk that can carry a decent amount of hardware. You never know what can happen tomorrow, maybe you are going to change your mind and then you might need twice the load. If you are looking for a great quality desk that is durable, has a lot of different configurations, and offers a sleek and attractive design, Walker Edison Soreno 3-Piece Corner Desk is the right one for you. With a dimension of 51″ W x 20″ D x 29″ H, this desk doesn’t offer a ton of space, but the right amount needed for a regular user. Don’t expect to put all your hardware on top of it and keep it that way, because there is a huge chance its tempered glass surface will break and turn your lovely gaming desk into pieces. This is a discrete option desk, enough for your monitor, speakers, keyboard and a mouse. There are no shelves or drawers, which means all your accessories will have to be placed somewhere else. Also, the sliding tray for a keyboard could be a bit bigger; therefore, if you are into large stuff, you’d better avoid this desk. 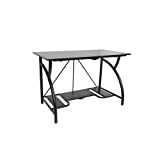 Yes, Walker Edison Soreno 3-Piece Corner Desk has its disadvantages and maybe it is not the best L shaped gaming desk you can buy, but if you accept it for what it really is, you will get a real bargain. Many configuration options, great quality, cool looks and durability, it has everything that is expected from a good desk. Atlantic Gaming Desk is a sturdy, affordable desk that offers plenty of space and can hold the most weight of all the desks in the class. That is mostly the result of its construction and the fact that it is made out of steel rods and carbon fiber that give it an additional strength and guarantee for its longevity. Great cable management system, and its universal design that allows its use for all sorts of desktops, laptops and consoles, are just a bonus to its overall great impression. Equipped with a drink holder and a headphone and speaker storage, Atlantic Gaming Desk is an excellent choice for any serious gamer and his or her gaming PC. With superb weight hold of 40 pounds and enough space for a 27″ monitor, as well as great stability, this desk has all that you could be expecting from the best gaming desk. Although not the cheapest, Atlantic Gaming Desk delivers an amazing value for the money, and your every dollar will be well spent. There are not that many desks that offer a unique and at the same time simple design like the Origami Foldable Computer Desk. Maybe it is not the fanciest piece of furniture you have ever seen, but it does its job superbly. It offers plenty of space on its top, has a huge bottom shelf for all the documents, accessories and paperwork you have, it can be folded in a minute and put away, gives a stable construction, but is at the same time lightweight. All that you need is there. Easy to keep clean, with dimension of 47.2” L x 23.6” W x 29.9” H, a surface not prone to scratches, large capacity and its simplicity, that allows for its tool-less assembly to be finished in less than a minute, this desk presents a great solution for any teen gamer or people who just want a proper place for their work. Origami Foldable Computer Desk is definitely among the best gaming computer desk options out there with great portability and plenty of storage for its users. With a large working space, raised monitor shelf, keyboard drawer and a stylish, attractive design, Z-Line Belaire Glass L-Shaped Computer Desk is the perfect fit for anyone looking for both practicality and cool looks. Relatively cheap, with a tempered glass scratch-resistant surface, clear finish and interesting compelling design, this desk shows that things that look good don’t always have to cost a small fortune. A ton of space on working surface allows you to put all the hardware and paperwork you want on top of it, while its sturdy metal frame and reinforced welding joints take care that it can hold all of it in place, offering the full stability and durability of the desk. Its dimensions of 24” L x 60” W x 37” H and the functional L-shape make it more than suitable for corner placement, while its lightweight and easy assembly just add to its overall great practicality. Limited lifetime warranty, in addition to a list of already great features, just sums up a more than positive impression about this great desk that can be considered as one of the best cheap gaming desks on the market right now. Simple, with a sturdy construction, TOPSKY L-Shaped Computer Desk presents a confident alternative to all those who are planning on using multiple computers at the same time, of all the sizes and shapes. Made out of quality materials, with a durable and a strong build, this desk can hold weight of up to 300lbs, which is among the best in the class. TOPSKY L-Shaped Computer Desk presents a great value for the money and is an amazing choice for this price, maybe even the best gaming desk under $200. With the dimensions of 55” L x 55” W x 29.9” H, it offers a plenty of space on top and bellow it. Although simple, without a standing for a monitor and a sliding drawer for a keyboard, which might be unacceptable for some, this desk presents a comfortable and practical option to the majority of the users. If you are not too concerned about its 63lbs of weight, which puts it on the list of not that mobile-friendly desks, and have a need for a piece of furniture that can hold a lot of hardware weight, TOPSKY L-Shaped Computer Desk is one of the best choices out there. Need Computer Desk doesn’t offer a ton of features or the great looks, but the simplicity and a large weight load of up to 900lbs. This might not be fancied by everyone, but this desk doesn’t represent itself as something it is not. Its main goal is to hold heavy weights, and that is something that it does marvelously. With the dimensions of 55” L x 23.7” W x 29.5” H, Need Computer Desk offers plenty of space for multiple gaming monitors, or any other type of hardware, making it a great option for users who do not just stick to the basics. Produced in six different colors and coated with a waterproof anti-scratch glossy finish, this desk will settle perfectly in most offices, making itself an interesting part of the interior decor. 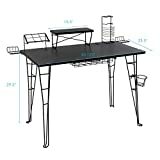 Easy to assemble, with adjustable leg pads, and made out of powder-coated metal, Need Computer Desk is a quick and easy solution for all the people who want a fast and durable solution for a variety of purposes, from computer table to writing desk or a dining table. All that is possible with this great multipurpose desk, which might not be the best gaming desk you can find, but is surely among those that can hold the most weight on top and below it. The word that best describes the Tribesigns Modern Simple Style Computer Desk is already contained in its name: simplicity. Easy to assemble, with only the basic features and with a large working area, this desk is practical and multifunctional at the same time, and it can be used for gaming, dining, as a regular office desk, etc. Large and high-quality made, this desk is built to last. Its steel frame gives it a much-needed stability and sturdiness, even allowing for a use of dual monitor racks. 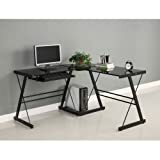 Easy to clean, with modern looks, adjustable leg pads, low price and dimensions of 47.2″ L x 23.6″ W x 29.2″ H that give plenty of space for various configurations and storage options, this desk is a great solution for anyone looking for the best budget gaming desk. If you also add in the fact that this desk can hold up to 900lbs of weight, its whole image gets even brighter than it already is. Cool looking, with distinctive design and a lot of space for storage, Convenience Concepts Modern No Tools Student Desk is a great option for a student or office desk. 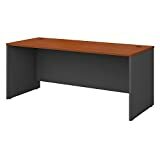 On the other side, all the fans of PC gaming should avoid this desk, since it’s too narrow (15.75″ L x 47.25″ W x 30″ H) for even a monitor and not to mention speakers, keyboard, mouse, etc. that would also need to find their space. It could all fit, but it would be just too crowded. Luckily, fans of the gaming laptops aren’t in this group of misfortunes and can fully enjoy the beauties of this great desk. Easy to assemble, without a need for tools, with poles made out of stainless steel, smooth finish and five color alternatives, Convenience Concepts Modern No Tools Student Desk is an ideal solution for all sorts of surroundings and purposes. It will fit wherever you put it. 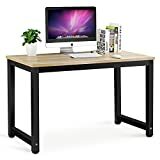 Although it does have some limitations, this desk is without any doubt a super cool addition to any room, especially when you think about its very low price, which automatically qualifies it the best gaming desk under $100. This is a very practical, and at the same time, amazingly designed piece of furniture that will add another dimension to your working space. Heavy, but at the same time very sturdy and stable, Bush Business Furniture Series Office Desk isn’t made for playing around, but for serious office work or gaming. With multiple options for upgrade, from storage cabinets to various extensions, including L-shape ones, this desk presents just a basic option that shows only a glimpse of its full potential. Dimensions of 71.1″ L x 29.4″ W x 29.8″ H and the weight of 130 pounds, just prove that this desk isn’t for everyone, but for the people who know to value quality when they see it and are ready to pay a fair (not that small) price for it. Made out of durable materials, with surfaces made out of thermally fused laminate that prevents scratches and stains, and with a 10-year warranty, this desk is made to last and to become your loyal companion in the years that are in front of you. Spacious design, stable built, durability, many upgrade options, and good wire management, are just some of this desk’s great features that make it one of the best PC gaming desks your money can buy. If you are into monumental, long lasting things, there is no better desk for you than this one. Easy to install, with foldable design and without a need for any kind of tools, Coavas Writing Computer Desk is a great choice for every person who needs a practical, portable desk for their office, living room, or one to use as a gaming desk. Thanks to its folding mechanism, it is easily packed and can be moved away or placed on some very narrow spaces, giving another plus to its practicality. Equipped with a solid metal frame and a waterproof MDF (Medium Density Fiberboard) working surface, Coavas desk offers great durability, but a limited carrying weight. It can hold your monitor and all the accessories (keyboard, mouse, speakers, etc. ), but your case should stay on the ground. Although solid, its foundation isn’t that great for holding some heavier weights. Also, desk’s dimensions of 39.4″ L x 19.7″ W x 29.5″ H don’t deliver a great working surface, which also prevents installment of too much hardware on top of it. 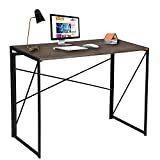 All in all, Coavas Writing Computer Desk is a cheap and decent desk. It isn’t the best PC gaming desk you can find, but it offers some great features, such as foldability and a solid structure. Fact is that you won’t be disappointed with this one, but there is a plenty of options in this category; therefore, think twice before you decide. If you need a desk that can hold a lot of weight, that can carry up to three monitors, a PC, a bunch of accessories and that looks great on top of all that, Arozzi Arena Gaming Desk should be your buy. With a huge working space of 14 square feet and overall dimensions of 63″ L x 32.2″ W x 31″ H, this is the desk that can carry even the most robust gaming configurations. Sturdy steel legs combined with a water-resistant surface made out of solid wood, covered with microfiber and equipped with holes for cable management, offer great durability and guarantee for more than a pleasant gaming experience. Coming in five different color schemes, with a gigantic working surface, adjustable feet, solid construction and capacity of 176lbs, Arozzi Arena Gaming Desk is the best desk for gaming on the market right now. Although heavy on the price, its great set of features and quality of the build make it worth the money. In other words, if you are into die-hard gaming, this is the desk you should go for. We hope this guide solved all your doubts about what the best gaming desk is. If it didn’t manage that, we hope that it at least helped you a bit in that search and that you are few more steps closer to the final choice. Good luck! 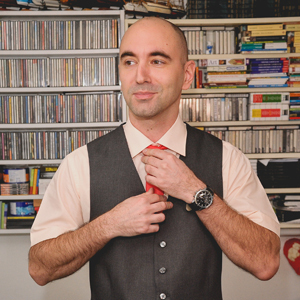 Miodrag Matović is an experienced writer with a love for computers and all their parts. 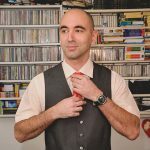 Although he is a graduate graphic designer, his life took a different turn and he realized his true passion through writing about tech-related topics. He also likes to cook, read stories to his kids, and eat pancakes.